Mrs. Tammy Robles serves dual roles at CSW as librarian and afternoon office assistant. Prior to joining CSW, Mrs. Robles, a graduate of Xenon Cosmetology School for Esthetics, worked as a cosemetologist before staying home to raise her children. She and her husband, Jeff, have two children — Taylor and Jonah. The Robles attend NewSpring Church. When Mrs. Robles isn’t keeping things running at CSW, she loves to craft, making farmhouse signs, furniture and decor. She also enjoys cooking and spending time with her family. 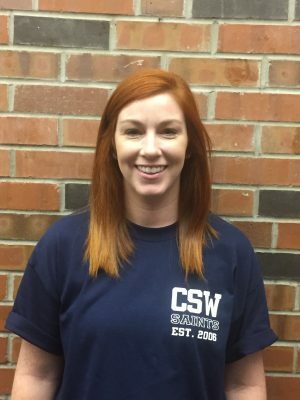 As a CSW parent, Mrs. Robles says she loves that her job allows her to be close to her own children in addition to helping her get to know students and families better while supporting the school.